Preparing for the holidays can be stressful, and the mess that comes after them is sometimes worse. Your kids have lots of new toys and they’ll want to take them all out and play with them. This creates a cluttered home and a lot of stress for you. 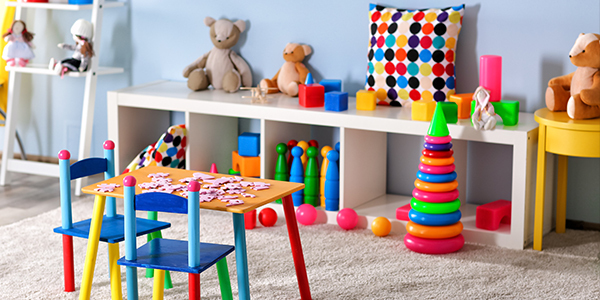 This year, make the resolution to get organized and declutter toys in your home. By following these 5 methods for decluttering toys, you can reduce the number of toys in your home, and make clean-up fast, easy, and stress-free. The first, and easiest way to declutter toys is to simply get rid of the toys that are no longer loved. Take a day to go through all your children’s toys and books. Anything that is broken, ripped, or outgrown can be thrown away or donated. You should also look for any duplicates and decide if you need more than one. Another great way to get rid of unloved toys is to practice hiding one to three toys a month that you suspect your kids don’t play with anymore. If during that time they don’t ask about the toys or search for them, you can get rid of them. It’s a great way to declutter and get rid of unused toys without risking getting rid of toys your children really love. This method is a great way to ensure your home doesn’t become too cluttered with toys. Every time your child brings home a toy, have them pick 2 toys to donate. It teaches your children the gift of giving to those less fortunate and makes room for the new toy they brought in. By putting this rule into place, your children will likely be pickier about which toys they ask for because they will know that two of their toys at home will have to go. This method of decluttering allows your children to take part in organizing their toys and gives them ownership of which toys stay and go. Plus, it controls the volume of toys in your home. Get every single toy and book your children own and put it into one big pile. Don’t leave anything out. Determine about four to five different categories for the toys and start dividing them out. Don’t go overboard with categories – general ones will do. As you are sorting through the toys, get rid of any duplicates, broken toys, and anything your kids have outgrown. Next, find some toy storage bins to divide the toys. Depending on the number of toys you have, you may need three to five toy storage containers. Try to distribute all categories evenly between each bin. Set aside large toys like scooters or rocking horses that your children use daily. At the end of each week, put all toys back into their container and replace them with the next week’s container. By cycling through each toy container weekly, your kids will continue to get fresh toys and will be more creative and engaged while they play. Having fewer toys to play with weekly will lead to less toy clutter and a more organized home. One of the easiest ways to organize toys is to separate them by category into toy storage containers. To avoid having plastic bins all over your playroom, think creatively about what can be used as a toy storage container. For example, you can purchase a folding hamper from the dollar store and turn it into a toy storage hamper for stuffed animals or balls. Similarly, you can purchase a shoe organizer and place it behind the playroom door to store things like barbies, matchbox cars, or Legos. If you need to organize toys in the living room, consider storage options like toy storage ottomans or toy storage bean bags that hide toys in plain sight. There are lots of varieties of toy storage furniture that can disguise themselves and keep clutter out of your living areas. Once you have separated your toys into categories, spread them out. Toys should not all be kept in one place, as this easily leads to kids taking out every single item. Instead, designate specific areas of the room to one toy category or task. For example, if you have a play table, keep play-doh and art supplies near it. On the other side of the room, store Legos and building blocks. This method helps with clean-up as everything will stay within its own category. It also helps keep kids focused on one toy at a time. Dividing the room into sections will help distinguish zones for your children. They may choose to rotate zones, and will quickly become accustomed to the layout of the room and understand where to go for the specific type of toy they wish to play with. Those are just 5 easy methods to declutter toys this year. Which method will you use to organize toys this year? Let us know in the comments! Ready to organize toys, but not sure you are ready to get rid of them quite yet? Storage units are a perfect solution if you are looking to grow your family and need somewhere to store the outgrown toys in the meantime. To get started, visit the Guardian Storage near you, where our trained, professional managers will help you find the perfect unit.